On January 12, 2003 I acquired the Fishmobile from another member of the Burning Man community. Outside are many painted fish and bits of plastic (all blacklight sensitive). Inside are many more fish (awesome job!) and lots of blacklights. They had built supports for blacklights outside the vehicle so the outside fish glowed too. The theme this year is "Beyond Belief". What lies beyond belief? Transformation! The interior of the fishmobile will be lined with a maze of intertwining beliefs. Participants will start and either follow or challenge their beliefs. Along the way they will experience many textures, puzzles, people, art and choices, all under blacklight... with fish. At the end of the maze will be a thought to ponder, which will somehow be related to the theme of tranformation through challenging belief. The fishmobile will cruise the playa at night for everyone's enjoyment. We are not planning for it to be open during the day. It will be parked in our camp. We will not provide alcohol. We won't prevent someone from bringing a drink, but this won't be a rolling bar or drunk zone. 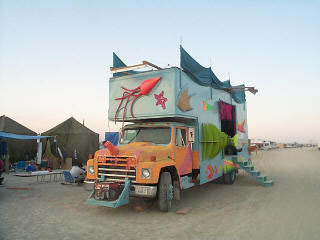 We will use the fishmobile to transport the Desert Nose and related gear to and from Burning Man. Once the nose is built, the remaining gear will be stashed in the Home Dome, except for some key tools and valuable stuff that will be locked in a secure area of the fishmobile. The night of the burn the fishmobile is reserved for the use of our own camp. The roof will have been reinforced enough to support at least 10 people (possibly more -- TBD) so there will be room to sit on top and watch the burn. Different people will take shifts driving the fishmobile on different nights. Most likely in teams of two. Beginning in March I'll send out a call for volunteers and together we'll decide what needs to be done and who will do it. For more info on our team, check here.